Large puzzle with 48 pieces. Teaches about planets and the solar system. 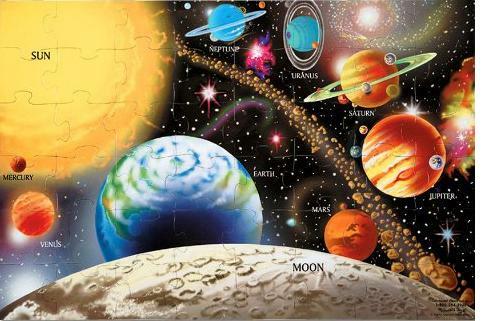 The Melissa & Doug Solar System Puzzle with its large puzzle pieces is designed for younger children ages 3 to 5 but we believe that even children over 5 years old (probably up to 8 years old) can enjoy this game as the puzzle is so nice to look at once completed. The puzzle is relatively large (24” x 36”) and comprises 48 pieces. The picture is colorful, includes all the planets, the sun and the moon and even the asteroid belt. This puzzle is a great way for kids to learn the names of the planets and to discuss the solar system as all the names of the planets are indicated. Kids can learn where the planets are in relation to one another. They can also learn which planets are gaseous (Jupiter, Saturn, Uranus, Neptune), which are terrestrial planets (Mercury, Venus, Earth, Mars),which planets have rings and which is closest to the sun, etc. Children also discover that there is an asteroid belt. The puzzle can be glued together and be used as bedroom decoration once assembled. Another reason why we recommend this puzzle is the fact that it is very sturdy and durable.